Often we are not in control of the prices that retailers set for our books (amazon, for example). They change fairly often, so we've decided not to put prices on this page. I know. I hate it too, but we'd rather not have incorrect prices, than no prices at all. When you click on the links for more information, we'll include prices when it is possible. Remember, too that for some of our books we offer trainers, managers, and others the ability to save signficantly to licence our content or to buy mulitple copies. 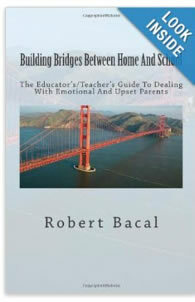 A common thread throughout all my books is a focus on better communication, and working to prevent disagreements and conflicts from escalating. 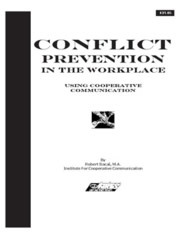 A number of the books below deal directly with conflict interactions, and the skills you can use to reduce the impact and intensity of emotions around them. Don't miss our "shorter form" mini-guides that we've produced to serve as summaries of various topics like performance reviews, conflict management, interpersonal communication, management and leadership. To view our mini-guides, click here. (Note: many of our books and mini-guides can be bulk licenced so you can save up to 85% if you purchase in volume). 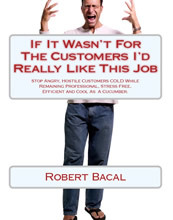 Based on our seminar, this isn't a rehash of the usual tips to deal with difficult customers. Written for government, but over 100+ techniques work anywhere. Contains dozens of exercises, "homework" with a special focus on transfering the techniques to the workplace. More than just phrases. 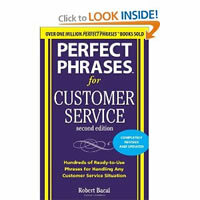 learn customer service strategies for any customer situation. problem solving oriented. 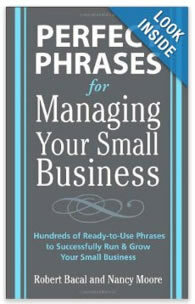 One of my favorites, due to the economy of words, AND economy of price (around $10.00) Learn what to say in a number of challenging cusotmer service situations! 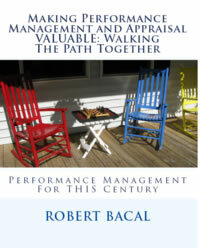 In a hurry to improve performance management in your organization? 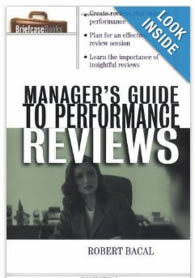 This 50+ page guide is meant for HR and managers who want to learn how to make performance management and reviews work in THIS century. 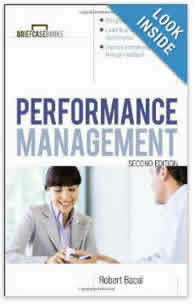 Now in its second edition and published by McGraw-Hill, this is a readable and complete book that covers all aspects of managing employee performance to improve productivity. 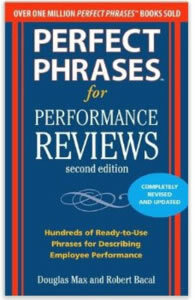 In this second edition, we moved our employee review phrase book way beyond others by explaining HOW to use the phrases in the book. Former best seller on the BusinessWeek list. If you aren't setting goals for employees, not only are you missing out, but you are creating loads of extra work for YOURSELF, as a manager. 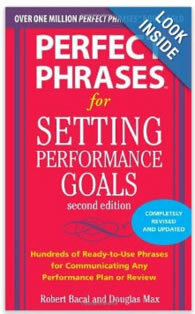 We walk you through the various kinds of goals, shatter a few myths, and provide hundreds of examples. 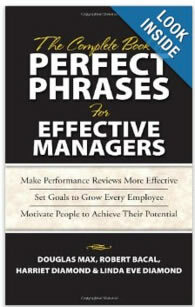 Combines two of my books on performance reviews with a book on how to improve employee motivation. Not just for beginning supervisors. Even experienced managers will pick up some valuable tips. 576 pages and you get three books for the cost of two, and it's still under $20.00. Managers and employees hate employee performance reviews, and for good reason. They are usually done poorly, have little ability to improve performance, because they aren't done right. 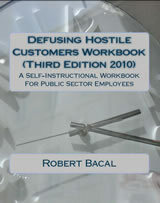 Learn how to do them properly in this McGraw-Hill Briefcase book. 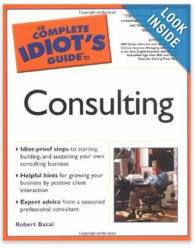 Ideal For Those Who Want To Enter The Consulting World, or Long Time Pros. Unfortunately, officially out of print. Highly reviewed book on consulting, including coverage of ethics, defining the customer, the business of consulting and a lot more. Unfortunately, also out of print, but used copies may be available. 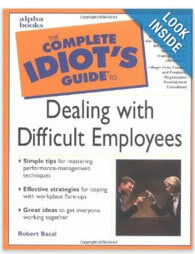 Written primarily for managers and supervisors, a lot of the advice in this book can be applied to employee to employee problems. I have a few copies left. Email if you can't find one elsewhere. Check Amazon for availability and contents of this book. 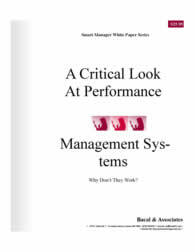 A short book of about fifty pages, you'll learn why most performance management and review systems fail to add value to the organization, and why they drive both managers and employees crazy. Available only in downloadable PDF format.